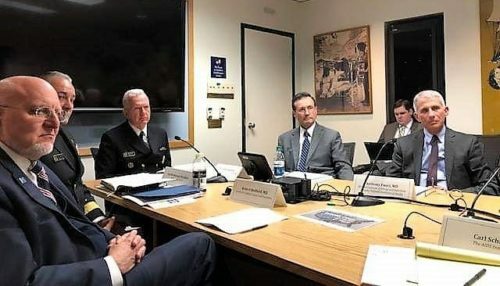 Amid the continuing scandals this week, including purchasing college placements and Boeing’s aviation disaster, the month-late budget from Dictator Donald Trump (DDT) lost its media traction after a day. It does, however, present his priorities of wall ($8.6 billion) and the military ($750 billion) with a $34 billion increase, priorities which translate into a white country and war. Every line item except the census, private VA care, and deportation/detention took hits—some of them huge. The budget even indicates expectations of ongoing annual deficits of at least $1 trillion while keeping tax cuts for the wealthy and big business. White House economic adviser Larry Kudlow claimed that rapid growth needs these cuts, but the Congressional Budget Office projects 2019 GDP growth at 2.3 percent, down 25 percent from 2018. Last year’s unbalanced budget of $4.4 trillion relied on rose-colored economic projections that didn’t see fruition. The ten-year budget projects a $1.1 trillion deficit in 2019, 2020, and 2021, and a $1 trillion deficit in 2022 with the national debt ballooning by 50 percent in the next decade by 2029. Over 51 million U.S. households—43 percent—cannot afford the basics of food, transportation, and healthcare. The food stamps for 19 million people are equivalent to the tax cuts for the top 1 percent, and they go directly to improve the nation’s economy, unlike tax cuts for the wealthy. The nine percent cut to non-defense programs hits Section 8 housing vouchers, public housing programs, Head Start, the Women, Infants, and Children (WIC) nutrition program, and Low Income Home Energy Assistance Program, among others. DDT’s budget cuts the Community Development Block Grant that includes Meals on Wheels program that delivers meals to low-income seniors to help them eat and stay in their homes. The cut of 16.4 percent in HUD eliminates the public Housing Capital Fund and the HOME Investments Partnerships Program as well as the National Housing Trust Fund that helps low-income renters such as veterans, people with disabilities, seniors, and households experiencing homelessness. DDT’s federal work mandate for food stamps and Medicaid opposes even the GOP Congress. Despite his promise to help manufacturing workers, he eliminates the Manufacturing Extension Partnership, which helps small- and mid-size manufacturers compete. The budget also funnels the funding for the Consumer Financial Protection Bureau (CFPB) through Congress instead of the Federal Reserve. If Republicans regain control of the House, the CFPB can return consumers to the mercy of financial scammers, big banks, and Wall Street special interests. DDT’s biggest cuts are to agencies designed to protect people in the United States, including workers’ safety and rights. This Monday, March 18, another shoe will drop in the series of financial disasters when DDT has to release the proposed detailed budget. Last year, he tried to cut Head Start by $1.3 billion a year, eliminating vital early education for hundreds of thousands of low-income children. He also tried to wipe out Legal Services Corporation, legal representation for almost 2 million low-income people, along with the Low Income Home Energy Assistance for 6.7 million low-income families, 90 percent of them with a senior, a child, or a person with a disability. If DDT meets his deadline, people will see the next hit list of poor people. 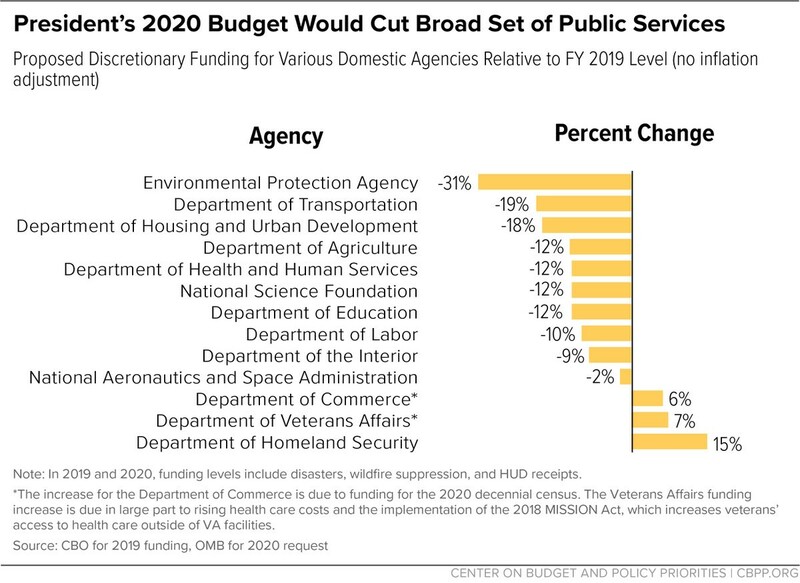 DDT’s budget feeds his ravening base: increases call for his wall and military, and decreases punish the poor, considered by his base as undeserving. He expects more money from additional fees, already dismissed by Congress, and a rosy high economic growth of over 3 percent, an idea negated by the Congressional Budget Office which predicts 1.6 and 1.8 percent over the next ten years. More optimistic, the Federal Reserve settled around 2 percent annual growth. The lowest growth rate in a half century, the 0.4 percent increase because of the tax cuts is 4 to 9 percent lower this year when considering inflation. Press Secretary Sarah Huckabee Sanders began her defense of DDT’s budget with a lie, that it keeps his promises, and Russell Vought had to cover for her with more lies. (The White House calls Vought “director of Office of Budget and Management” although Mick Mulvaney, acting chief of staff, never resigned from being OBM Director.) Asked about DDT’s promise “eliminate the national debt in eight years,” Vought blamed President Obama—who had nothing to do with DDT’s massive tax cuts for the wealthy and big business, his inflated military funding, and his trade war with China. Vought also lied about what DDT said in saying that he would “attempt” to pay off the debt. In addition, DDT’s promise was to “balance” the budget, which means eliminating the annual deficit that went higher than $1 trillion last year. Questioned about DDT’s breaking his promise for not reducing Medicare and Social Security, Vought said: “What we are doing is putting forward reforms that will lower drug prices and that, because Medicare pays a very large share of drug prices in this country, has the impact of finding savings. We’re also finding waste, fraud and abuse, but Medicare spending will go up every single year by healthy margins and there are no structural changes for Medicare beneficiaries.” DDT’s NAFTA proposal guarantees monopoly rights for big pharma so that they can avoid competition from generic drugs. DDT is already contorting the existing congressional budget by removing $385 million from programs to cover health needs for lower-income preschool children, HIV and cancer patients, and Alzheimer’s sufferers to detain over 15,000 undocumented youth in DDT’s manufactured border crisis. HHS Secretary Alex Azar reallocated $446 million to detention centers from healthcare programs such as those for teen pregnancy prevention and research for flu vaccine and women’s cancer. Azar’s latest announcement came after the report that 4,500 children have been sexually abused in U.S. immigration centers since 2014, including 178 abused by HHS staffers or government contractors running the facilities. People keep saying that they voted for DDT and still support him because he is a businessman and they want the United States to be run like a business. DDT business style is to use corruption and fraud to make money, declare bankruptcy and take money from investors, fail and get more money from his father, and move on to another company. When he applies the same system to the U.S., over 300 million people will be lost because there is no other country where we can go. 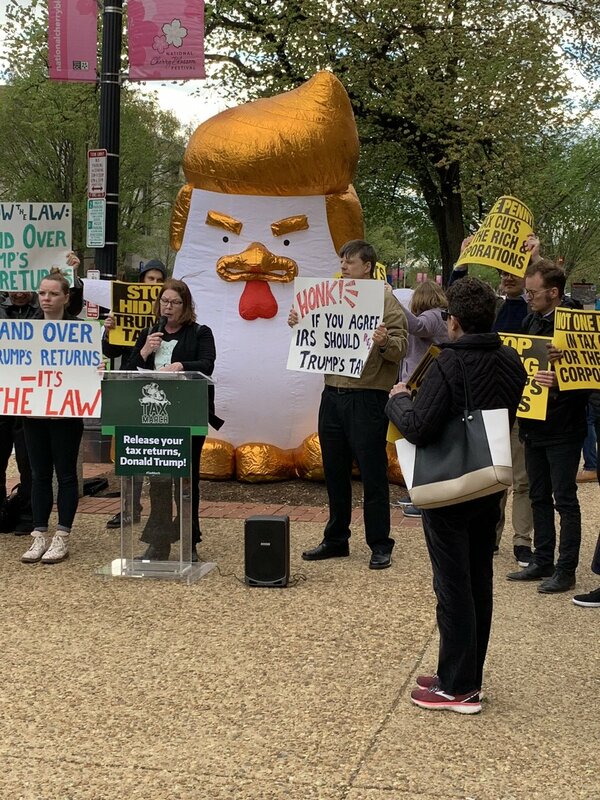 Dictator Donald Trump (DDT) has had another hard week: Jane Mayer’s article about the “Fox White House,” burgeoning investigations including a look into his giving his children high-level security clearances, and the revelation that North Korea is developing nuclear weapons after DDT took Kim Jong-Un “at his word.” The courts are also dealing DDT a few blows. Another judge has ruled against DDT’s citizenship question on the 2020 census, ruling that Commerce Secretary Wilbur Ross acted in “bad faith,” broke several laws, violated the constitutional representative democracy by deliberately undercounting specific populations, and lied under oath to Congress, according to uncovered emails. The Supreme Court will hear arguments about the questions in late April before the census materials go to the printer in June. In more lack of concern for human life, DDT revoked the mandate that the U.S. report the number of civilians killed in drone strikes outside war zones. Since he was inaugurated, a recorded 2,243 drone strikes, far more than the total 1,878 during President Obama’s eight years, have killed civilians. With almost no congressional oversight or media attention, DDT is also waging a secret war in Somalia, killing at least 252 people in two dozen airstrikes thus far this year. The Pentagon has deployed 500 U.S. troops, including special ops, in the country. Demonstrating disregard toward Palestine, DDT closed the U.S. consulate in Jerusalem serving as a de facto embassy for Palestinians and sending them to the U.S. Embassy to Israel where Ambassador David Friedman, fierce critic of Palestinian leadership, further recognizes Israeli control over Palestinian land in Jerusalem and the West Bank. DDT has also cut hundreds of millions of dollars in humanitarian aid to Palestinians which includes help for hospitals and peace-building programs as well as funding for the UN agency providing aid to Palestinian refugees. Last fall, he shut the Palestinian diplomatic mission in Washington. DDT’s son-in-law Jared Kushner, in charge of peace negotiations between Israeli and Palestine, said that the U.S. will reveal the deal, rejected by the Palestinian Authority, after April’s Israeli elections. Embarrassing even the State Department and the Department of Defense, DDT may demand that Germany, Japan, and possibly all other allies hosting U.S. troops pay the full price of U.S. soldiers deployed in their countries—plus another 50 percent or more. U.S. keeps bases in these countries for our benefit—for example, emergency care in Germany for U.S. soldiers wounded in Iraq and other hot spots. Although Germany sometimes opposes involvement in the Middle East, one German base provides a necessary staging post for U.S. military actions in Iraq and Libya. German bases also provide headquarters for the U.S. Africa Command, and marines crisis response forces in Spain and Italy protect U.S. interests and diplomatic compounds in Africa. If DDT removes the bases, the U.S. will lose the benefits while paying more of money to support the troops. In his testimony, Cohen said that DDT’s run for president was “to make his brand great, not to make our country great.” DDT proved Cohen right when he tweeted an advertisement for his Scottish golf course, incidentally violating two clauses of the U.S. Constitution. He may also be in deeper hot water if anyone investigates the financing for the golf course like Rep. Maxine Waters (D-CA) plans. Tens of thousands of dollars poured into DDT’s inauguration fund from shell companies hiding foreign contributors, at least one of them ineligible for political donations because of U.S. election law. The daughter for a contributor received a White House internship, and a Washington lobbyist has already admitted that he funneled $50,000 to the inauguration from a Ukrainian oligarch. Another $25,000 was traced to an Israeli businessman. Things are so bad for DDT that Forbes thinks his Trump Organization could be charged as a “RICO enterprise.” And Michael Cohen is suing DDT for almost $2 million in unpaid back legal fees from 2018. Since Democrats said that they would not have a debate on Fox, DDT said he would block other networks from hosting debates. DDT’s Mar-a-Lago buddies call him “king,” perhaps making him think he has the ability to tell the media what to do. After giving trillions of dollars to the wealthy and big business, DDT plans to become the king of fiscal responsibility. On the first of March, the U.S. national debt hit $22 trillion, requiring another vote to raise the debt ceiling following months of using “extraordinary measures” to pay the country’s bills. March 11 is the deadline for the White House to release DDT’s broad budget priorities. The man who bragged “I’ve made a fortune by using debt” will make deep spending cuts in the safety net which won’t pass the House and increase military spending. DDT may cause another shutdown. The U.S. budget gap climbed to $310.3 billion from October to January, up from $175.7 the same time during previous year, while tax revenues were lower after the tax “reform”—corporate payments down 23 percent and income taxes down three percent. Individuals still paid the same amount as last year, however, because prices of good increased at least $25 billion from the tariff costs. Between the tariff and IRS withholding, individuals paid $839, and business paid $73 billion. The surplus in January dropped from $49.2 billion in January 2018 to $8.7 billion in January 2019. DDT has found a flaw in his tax scam cut that offends his wealthy friends: because it restricts deductions of state and local taxes—including property tax—to $10,000 and the mortgage interest deduction to $750,000, people are leaving New York City and causing a decline in home prices. The reeling real estate market may cause a recession there. Republicans refuse to change that provision. Some of these frustrated tax payers may have formerly been doors to Republicans. When DDT expressed belief in the innocence of New England Patriots’ owner Robert Kraft, charged with soliciting prostitutes at a Florida spa, he forgot to mention that he watched the Superbowl at Mar-a-Lago with the spa chain’s founder, Li “Cindy” Yang, whose family still owns the spas. 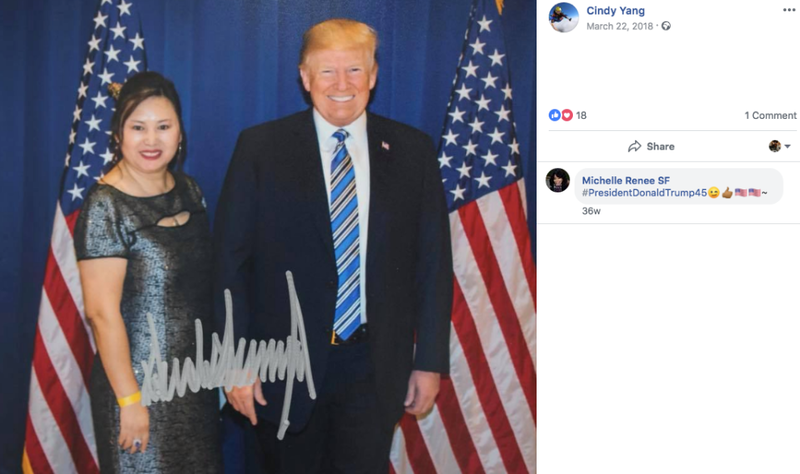 A visitor to the White House, Yang is quite a GOP supporter having posed for photos with Rep. Matt Gaetz, Gov. Ron DeSantis, GOP Chair Ronna McDaniel, and former Alaska Gov. Sarah Palin. DDT signed a photo with Yang. [visual Yang] Other photos show Yang with Rep. Louis Gohmert (R-TX) and Fox contributor Dan Bongino, who had a meltdown about its release. The big media buzz this week was the light sentence that Paul Manafort received from the first judge. DDT worked hard to spin the ruling into his favor, claiming that the judge said, “No collusion!” The judge, however, declared that Manafort wasn’t on trial for or convicted of “anything to do with Russian colluding in the presidential election.” The second sentence with a maximum of ten years will be delivered this coming week. The House of Representatives may be in recess to campaign for the next six weeks, but GOP members are still up mischief. Their vote to pass another round of tax cuts just before the November midterms gives an additional $3 trillion to the wealthiest people in the U.S. The vote of 220-191 included three Democrats; last year’s tax bill had no Democratic support. Part of the House tax plan costs come from the “Universal Savings Accounts” that has no limit for participation and permits withdrawal of funds before retirement. The shift of savings from taxable accounts primarily benefits the wealthy, the top one-percent of the population who can shift, on average, $9.5 million into tax-free accounts. The average 60 percent of people has $16,000 to shift. After the last tax cuts, Republicans began to threaten slashing or even eliminating Medicare and Social Security because of the escalating deficit; this will cement that deal. The Republicans can’t campaign on the last tax cut: people believe the law benefits “large corporations and rich Americans” over “middle-class families” by a 2-to-1 margin, 61 percent to 30 percent. With 42 percent of people reporting that they are less likely to vote for a candidate who supports the GOP tax plan, compared to 36 percent in favor of those candidates, only 1,039 GOP TV campaign spots, under 12 percent of all GOP TV ads this year, mentioned the new tax bill. That bill was the only GOP accomplishment. The House has departed at the same time that the Violence against Women Act lapses. Two weeks ago, the spokeswoman for House Speaker Paul Ryan (R-WI) reported negotiations with the Senate, but nothing has come of her promise. Even if the House took action, the GOP senate might oppose it. Lindsey Graham (R-SC), the most unhinged supporter of Kavanaugh, is one of six GOP white men on judiciary committee who voted against VAWA in 2013. Graham’s state has the highest rate of women killed by men in 2014, twice the national U.S. average, with 92 percent of the female murder victims knowing their killer and 62 percent having been in an intimate relationship with the murderer. The leniency of court sentencing allowing the attackers back out on the street in a short time is one factor for South Carolina’s high rate of violence against women. Stop localities from regulating pesticides: This interactive map shows some of the places in danger. Permit wealthy farmers to get crop subsidies: The new bill allows people making over $900,000 annually could give a loophole to exempt partnership, joint ventures, and other corporate farms. Eliminate funding for the Conservation Stewardship Program: Gone would be offsets for some farmer costs such as crop coverings to keep soil and fertilizer in place over the winter, buffer strips that prevent severe soil erosion from storms, and hedgerows as habitat for wild bees and other beneficial insects. O’Rourke told the crowd that Cruz missed one-fourth of the vote in 2015 and one-half the votes in 2016 and finished by saying, “Tell me, who can miss half the days at work and be rehired for the same job going forward?” Cruz was so positive that the senate would vote on Kavanaugh over the weekend that he canceled a debate with O’Rourke today. After the week’s hiatus before a vote, Cruz tried to reinstate the debate, but O’Rourke said that he was already booked. 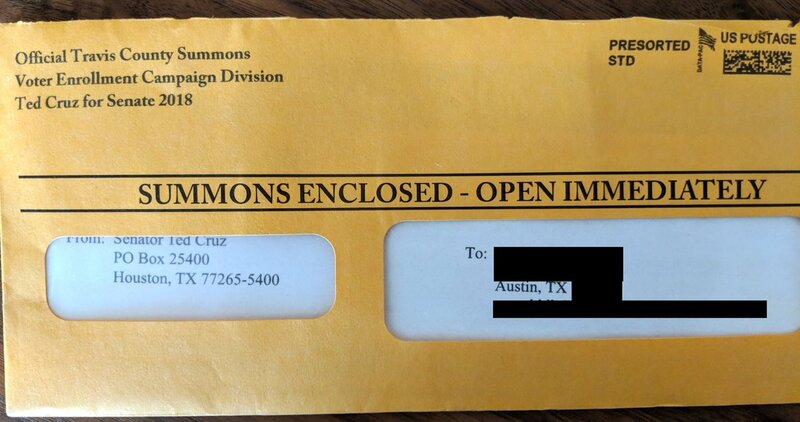 Donations were double for O’Rourke than Cruz as of June 30, another bad sign. Cruz’s campaign was based on ridiculing O’Rourke, but every attempt backfired. Incumbent candidate Rep. Duncan Hunter (R-CA) and his wife have been indicted on 60 charges related to fraudulent use of $250,000 in campaign funds in 200 incidences of lavish vacations and dinners, conspiracy, wire fraud, and filing false campaign-finance reports. Included in the information are at least five of Hunter’s “personal relationships” with photographic evidence. Hunter has denied the charges while he runs racist, anti-Muslim advertising against his opponent. He describes himself as a Christian conservative and committed family man. New York voters may also get another chance to elect a potential criminal: Rep. Chris Collins, charged with insider trading, decided he will run for re-election this fall after claiming that he wouldn’t. He has an 80 percent chance of winning in the conservative district, according to fivethirtyeight.com. DDT slammed the DOJ for indicting these two representatives before the mid-term elections. Long live the swamp! Fearing rough competition to his race to become Florida’s governor, former Rep. Ron DeSantis (R-FL) quit four months early to campaign—over 16 percent of the term that his voters expected him to serve. He might use the time to speak at more white supremacist conferences after the four times he addressed ones organized by the David Horowitz Freedom Center audiences. The organizer has said that blacks owe their freedom to whites and that the nation’s “only serious race war” is against white people. He told them that he admires “an organization that shoots straight … and is standing up for the right thing.” DeSantis started campaigning for the general election with the use of “monkey this up” when talking about his black opponent, Andrew Gillum. Tony Ledbetter, Volusia County GOP chair and paid employer for DeSantis’ campaign, posted a demand to move “animals … from our country.” Speakers at Horowitz conferences have made more disgusting comments about minorities, especially blacks. DeSantis resigned as administrator for a racist and Islamophobic Facebook group laden with conspiracy theories immediately after his affiliation was made public. Virginia GOP Senate candidate Corey Stewart remained as administrator. Thanks to the laxness of the FEC, Rep. Mia Love (R-UT) violated election rules by keeping money raised for her primary campaign although she faced no challenge. Questioned about her actions, Love said she would keep the money and reclassify it later. Taxpayers are still ponying up the money to pay for congressional members’ sexual assault settlements because Congress cannot agree on a law to stop it. Congressional workplace misconduct has cost taxpayers almost $15.2 million from 1997 to 2014. Does the Supreme Court have this arrangement to pay victims of sexual assault? One wealthy donor is fed up with Republicans. Les Wexner, owner and CEO of L-Brands in Ohio, said he is “no longer a Republican” and spoke warmly about President Obama and his theme of bipartisan civility. Wexner said, “I was struck by the genuineness of the man; his candor, humility and empathy for others.” A year ago, Wexner had told his employees that he felt “dirty” and “ashamed” because of DDT’s response to violence at the Unite the Right rally that killed a person in Charlottesville (VA). “Republicans would get tax cuts for the well-connected and a right-wing majority on the Supreme Court, and in turn would overlook every assault on decency, truth, our oldest allies and most venerable principles. They expected Trump to govern by grudges, lie eight times a day, call women dogs, act as a useful idiot for foreign adversaries, make himself a laughingstock to the world…. GOP congressional members are willing to sell out every Republican value in a sycophancy to DDT including a belief in their party over country. Today is Labor Day, a day to celebrate workers, and Dictator Donald Trump (DDT)—aka the “jobs president”—honored the hard-working people of the nation by attacking Richard Trumka, leader of the nation’s biggest union federation. Trumka dared to point out how DDT had “done more to hurt workers than to help” them and disagreed with DDT’s strategy on renegotiating the NAFTA trade pact because he might lose Canada. Eliminating overtime pay for workers by dropping the salary threshold to the same one from 40 years ago. Attempting to give tips for waitpeople to their employers. Classifying workers as “independent contractors,” permitting employers to deny them benefits. Failing to pass legislation for infrastructure improvement. Signing an executive order that allows investment brokers to cheat people in their retirement funds. Blocking workers from the courts with mandatory arbitration clauses in employment contracts. Delaying and rolling back regulations to protect workers from job injuries. Refusing to shield workers from exposure to cancer-causing chemicals and metals like beryllium. Allowing employees to keep faulty records about on-the-job injuries. Blocking a requirement to report pay data by race, ethnicity, and gender, allowing larger racial and gender pay gaps. Creating barriers for home care workers who want to support their union. Proposing a family leave plan that forces workers to have less Social Security benefits when they retire. Forgiving employers who violate wage and hour laws. Limiting workers’ ability to decide with whom they want to form a union. Making it harder for workers to bargain with the companies that influence their working conditions. Disbanding labor-management forums for federal workers. Endangering workers and first responders at chemical facilities. Undermining the quality and pay of apprenticeship programs. Limiting workers’ right to sue. Reducing transparency in anti-union attacks. Making it harder for workers to save for retirement. Enacting tax cuts that overwhelmingly favor the wealthy over the average worker. Pushing immigration policies that hurt all workers. Stacking the Supreme Court with anti-worker justices Neil Gorsuch and Brett Kavanaugh. Specifics about DDT’s anti-worker agenda. Last week DDT canceled a scheduled Congress-approved 2.1 percent pay raise for 1.8 million civilian federal employees at a time that the 2018 inflation is projected at 2.9 percent. These people include Secret Service, firefighters, and border patrol agents. One-third of them are veterans, many of them disabled. He claimed the purpose of the $3 billion savings was to “put our Nation on a fiscally sustainable course” because of “national emergency or serious economic conditions affecting the general welfare.” At the same time, however, he has figured out how to give an additional $100 billion to the wealthiest after he and Congress passed $2 trillion tax cuts for the richest and plan another tax cuts this fall for the richest in the nation. Before a second tax cut, the new tax loophole for “passthrough” businesses that benefits the Trump Organization will cost $47 billion in just one year, and the tax cut for wealthy, multimillion-dollar estates costs another $8 billion. Since the 1930s, union workers have earned about 20 percent more than non-union colleagues. More than that, however, a recent study shows that more unions meant more income equality because they increased the wages of the lowest-skilled. 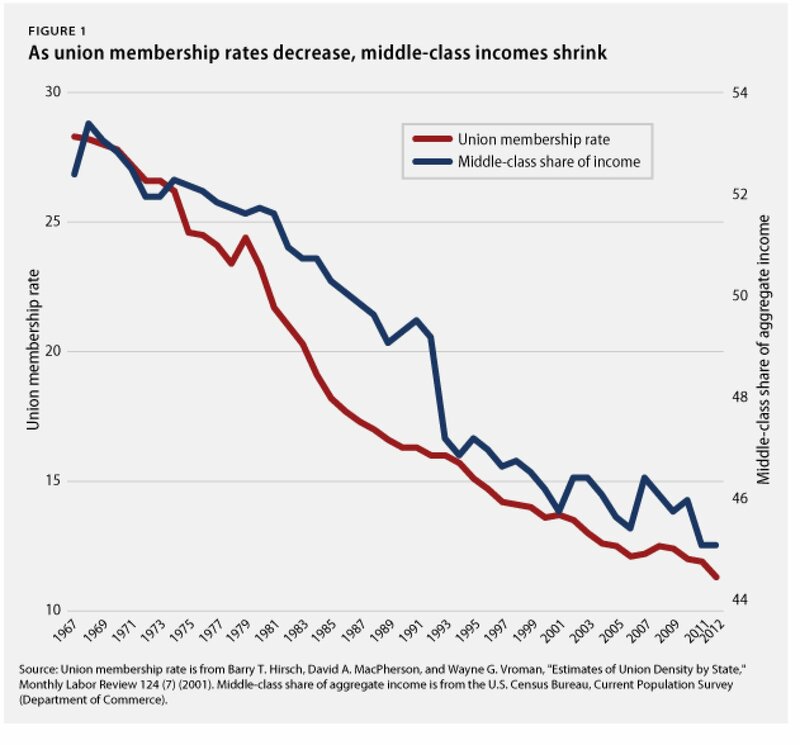 The chart to the left shows the correlation between the drop in union membership and the drop in middle-class income. Instead of working to raise their wage by demanding unions for all, however, those not in the union try to tear down unions. And the wealthiest and biggest businesses want an even larger share of the pie so they work to kill unions as they did in the Supreme Court Janus decision. Riding on their victory in Janus, the conservative Illinois organization Liberty Justice Center has threatened to sue Oregon state and local government officials if they don’t immediately stop collecting union dues and agency fees. Oregon’s AG Ellen Rosenblum differs from the organization’s claim that unions cannot college any union dues until all employees agree to their membership. She had already sent an advisory after the Supreme Court ruling that public unions could not agency fees from a nonmember’s wages without the members’ becoming union members. Employers and business-loving conservatives don’t provide benefits out of the goodness of their hearts. Most people don’t recognize what unions have accomplished for all workers in the United States. Weekends, breaks (including lunch), 8-hour workday, 40-hour week, minimum wage, overtime pay, equal pay. Ways to fight discrimination (including age), wrongful termination, Americans with Disabilities Act. Paid vacation, sick leave, worker’s compensation, unemployment insurance, pensions. Sen. Ron Johnson (R-WI) said on a Sunday talk show that Republicans should concentrate on the “good things” that DDT has done such as tax cuts and eradicating regulations—both benefiting only the extremely wealthy and big business. 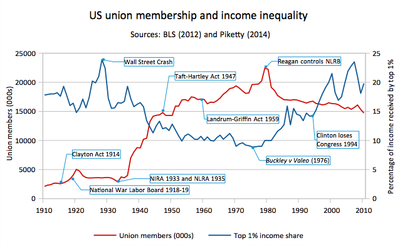 Reductions in union membership have a direct correlation with the increase of income to the top one percent. ObamaCare is more popular than the GOP tax law, according to a new Fox News poll, with a 51 percent approval rating compared to the 40 percent approval for the tax cuts benefiting the wealthy and big business. DDT complains that Google has a majority of negative stories about him. If he wants positive media, he should do something that’s positive instead of negative actions against everyone except the top five percent in the United States. DDT and the Republicans have come for the trade unionists. Are you next? Did Your Pay Check Go Up? Republicans will be running for re-election this year on their signature legislation of the first two years—a tax cut for the wealthy and big business. How’s that working out? CNBC’s All American Economic Survey from last week found one-third of respondents with more money in their paychecks from the law that will crank up the deficit by $1.5 trillion. Over half—52 percent—found no difference. Of the one-third with more money, under 40 percent—that’s about 13 percent of the respondents–said that the increase improved their finances “a great deal” or “a fair amount.” The remainder of the one-third said that the increase helps a small amount or not at all. Immediately after the bill was signed into law, a few corporations announced $1,000 bonuses. (That gives workers less than $.28 per day.) Raises are planned by 13.2 percent of companies, and tax savings for 44 percent of businesses will go to acquisitions and new equipment, including robots to replace workers. The rest goes for stock buybacks and dividends, causing the stock market to go up almost 2,000 points before it dropped almost 3,000 points. Workers may have seen little extra money in their paychecks, but the average banker bonus on Wall Street last year was $184,220, the highest since before the financial crisis. The richest 10 percent of stock owners owned 84 percent of all stock in 2016 while one in four jobs pays below the federal poverty level. Almost 37 percent of households in the nation are “liquid asset poor,” lacking enough savings to support their families for three months at the federal poverty level if they lose their jobs. The cost of houses has gone up 4.1 percent to $8,000 since last year while the median household income has increased by only 2 percent. Despite workers searching for temporary employment and jobs to supplement their other jobs, 40 percent of households have difficulty paying bills. 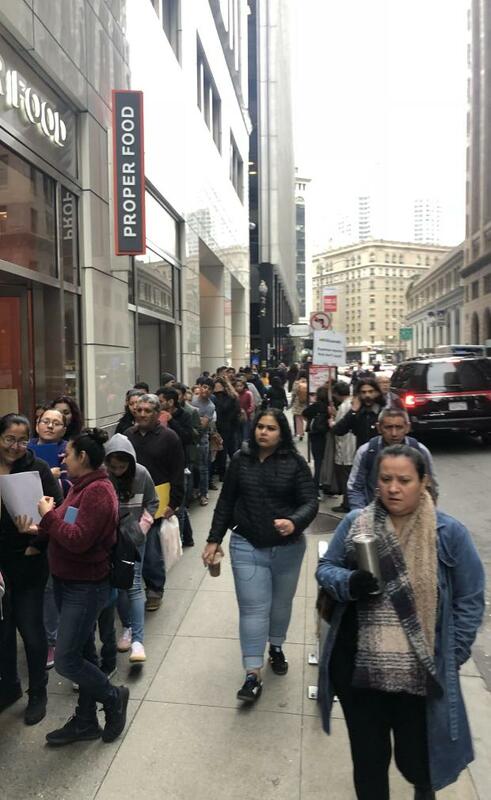 And the tax cuts have given a pittance—if anything—to these people, less than $60 to families earning under $25,000. Republican legislators did well with the new tax law. House Speaker Paul Ryan (R-WI) got $500,000 from the Koch brothers and another $500,000 from just five wealthy donors for his tax bill. The bill also gave Ryan a $19,000 tax break with his bill, far more than the $78 that Ryan bragged that a school worker received. The new law threatens affordable health insurance and Social Security, costing people far more than any extra they now receive. Over 12,000 retail stores are expected to close in 2018, up from the 9,000 that closed in 2017. Two-dozen major chains including Walgreens, Gap, and Gymboree are planning to close over 3,600 stores this year. Last year 50 retail chains filed for bankruptcy. Among 25 major retailers likely to file for bankruptcy are Sears, Bon-Ton Stores, Bebe Stores, Destination Maternity Corp., and Stein Mart. Almost one-fourth of U.S. malls, approximately 310 of 1,300 shopping malls, may lose its anchor tenants, causing other retail stores to flee. Even the bonuses come with strings such as longevity of service, and they are attached to firings and store closures, like those at AT&T, Lowe’s, Walmart, Pepsi, Carrier, Kimberly Clark, etc. The new GOP tax law causes huge problems for almost every state. Some blue states are examining the reclassification of state property and income state taxes as charitable contributions because that’s the biggest hit for places such as California, New York, and New Jersey. But almost all 41 states with personal income tax use either federal adjusted gross income or federal taxable income as their starting points for the state income tax. The federal shift can cause big swings in state revenue, causing losses of tax income. The almost-double standard deduction and giveaway to pass-through entities blows up the deficit on both the federal and state levels, and states will hurt even more with cuts in entitlement and safety net funding. Plus states’ responsibility for 80 percent of infrastructure funding will cause more problems. The federal government is taking taxes to give to the wealthy and big corporations leaving states in serious debt to take up the losses. And almost every state must meet a balanced-budget requirement, meaning no deficit from one year to the next the way that the federal government operates. One solution is to “decouple” from the federal code which means trickle-down complexity. The tax bill was based on lies, such as the one that the tax cuts will pay for themselves and not raise the deficit. Treasury Secretary Steve Mnuchin made the claim that his department had run the numbers and found no deficit, but he even lied about the existence of this study. Then Republicans will use the deficit to take away the safety net, including Social Security and Medicare. Not happy with everything that they have given to the wealthy and large corporations, Republicans are planning another tax cut bill. In the first one they passed last year, cuts for individuals expire in ten years; now the GOP plans to force a vote to make them permanent. If Democrats oppose the bill, the GOP will call them opponents of the middle class. The GOP plan to corner Democrats with Tax Cut Bill II may turn on them. Making the taxes permanent will add at least another $1.5 trillion to the deficit in the decade after 2025 while reminding people that the GOP favored corporations over them by making taxes permanent for businesses. Another problem for Republicans is that they need at least nine Democrats this time around because of different Senate rules, and they still won’t let Democrats be involved in talks about the bill. To pass the tax cut law, Republicans promised that everyone would get $1,000 or $2,000 or $4,000 during the next year depending on who was talking and when. People are beginning to figure out that the Republicans lied. The next arguments might not get swallowed as easily. Sen. Thom Tillis (R-NC) said, “The proof is in the paycheck. That’s a message we can run on.” It might be easier to use this for an election argument if the paycheck showed more money. Republicans are still planning to take Social Security and Medicare to pay for the deficit caused by tax cuts for the wealthy and big business. House Speaker Paul Ryan (R-WI) said last week, “The name of the game in debt and deficits is entitlements.” The GOP needs older voters who may not vote for candidates who take their living expenses and health care. With 15 days of work left before their holiday hiatus at the end of December, Congress may face a far more difficult task than in September unless they shuffle everything down the pike, as they did two months ago. Dictator Donald Trump (DDT) and the Republicans have more than a full plate for its few working days. Government shutdown: The lights in the government go off on December 8 without further action on the spending bill. Spending caps cause trouble for this bill, so House Speaker Paul Ryan (R-WI) may float another short-term bill, something that the Republicans lambasted Democrats for doing before the GOP was in power. The 2011 Budget Control Act set 2018 caps which will automatically go into effect in January without a deal to raise them. No legislation has been written, and the Senate needs at least 60 votes, meaning at least eight Democrats. Without a change in the law, defense programs get only $549 billion, and nondefense programs are limited to $516. DDT and the GOP haws want over $600 billion for defense, and Democrats want the same increase in nondefense spending. CHIP: The Children’s Health Insurance Program for nine million children and 370,000 pregnant women in poverty expired at the end of September, and funding may end up in the December spending bill. The program is running out of money for the first time since it was created two decades ago. The expenditure of $15 billion for CHIP is vital for preventative health care, but families are already receiving notice that their children can no longer have this coverage. DACA: The deadline for the Deferred Action for Childhood Arrivals program, allowing some undocumented immigrants brought into the country as children to work and attend school without fear of deportation, isn’t until March, but Democrats may force the issue as part of the spending bill. Tax cuts: At least 50 GOP senators must sign off on a bill that increasingly gouges people the poorer they are. Then the bill has to go to the House which either signs off on it or creates its own version and then sends it back to the Senate for approval. At least eight GOP senators don’t like the bill, each for his own reason, but they may end up caving in because donors are insisting that the GOP Congress do SOMETHING! Sen. Rand Paul (R-KY) wants to repeal with healthcare individual mandate, and Sens. Susan Collins (R-ME) and Jerry Moran (R-KS) oppose that part of it because the loss of the mandate may destabilize health care markets. Sen. Ron Johnson (R-WI) refuses to vote in favor of the bill unless he gets more perks for his personal small business. Sens. Bob Corker (R-TN) and Jeff Flake (R-AZ) are leading the charge in opposing the $1.5 trillion increase in the deficit. To keep the vote for tax cuts to a simple majority, the increase in deficit can be no more than $1.5 billion. As senators consider tweaks to keep some of the reluctant GOP senators in line, the deficit goes up, requiring that other cuts be made. One suggestion is to just eliminate all the cuts for individuals—not businesses—in the bill’s final year. The popularity of the tax cut bill is going down and may shrink even more with the Congressional Budget Office report that poor people are hurt even worse than previously thought. People making less than $30,000 a year could be worse off by 2019, and those earning $40,000 will be losers by 2021. By 2027, most people earning less than $75,000 are worse off. In addition, the increase in health insurance premiums will take four million people off any plans by 2019 and 13 million by 2027. The rest of the people, 38 percent of the population, will keep getting tax cuts. The chart below indicates the amount that the government will reap from different salary groups—for example, the group of people making under $10,000 will pay an additional $1,540,000,000 whereas those making over $1 million a year will gain $34,100,000,000. The negative sign before the amount means less revenue for the government and shows that the poor pay for the rich. FISA: Without a bill, this surveillance program expires at the end of the year, but bipartisan opposition to a “clean” renewal of warrantless spying comes from those who believe in privacy. At this time, Section 702 of the Foreign Intelligence Surveillance Act permits the government to collect emails and texts from foreign spies, terrorists, and other overseas foreign targets without warrants. Proposals have been cleared by the House Judiciary Committee and Senate Intelligence Committee, but neither has gone to a floor vote. The conservative House Freedom Caucus has pledged opposition because it violates the Fourth Amendment. Flood Insurance: The House has passed its version of reauthorizing the National Flood Insurance Program, renewing it for five years, updating federal flood mapping requirements, and bolstering a new private flood insurance market. The Senate, however, has made no plans to address the House bill. The NFIP is $25 billion in debt. Emergency disaster aid: The $44 billion package for Texas, Florida, Puerto Rico, and the U.S. Virgin Islands is too small, according to some Republicans from Texas, although it’s added to another $50 billion. Conservatives will demand that cuts elsewhere pay for the $44 billion. The budget from DDT goes only to these places for hurricane relief; DDT has offered not one cent to the Western states ravaged by wildfires. Iran: The 60-day deadline after DDT’s October statement that the nation is not in compliance with the agreement comes in December. Leading Republican senators want to keep the deal but pass legislation to keep Iran from developing nuclear weapons after the deal expires. DDT will need to waive sanctions to keep the nuclear pact intact. All these decisions are set against the background of ethics proceedings for continuing sexual assault and harassment accusations and a December 12 election to determine whether Roy Moore joins the Senate. Rep. Al Green (D-TX) has promised to force a vote to impeach DDT before the end of 2017. What’s missing from this list of must-dos? Restricting bump stocks or closing the domestic violence loopholes in the gun laws. Tax cuts: The GOP Has to Do Something! “There’s no economic justification whatsoever for a tax cut at this time. U.S. GDP is growing, unemployment is close to 4 percent (below what is commonly considered “full employment”), corporate profits are at record levels and stock markets are soaring. It makes no sense to add any federal government-induced stimulus to all this private sector-caused economic activity, let alone a tax cut as big as this one. This is actually the ideal time for Washington to be doing the opposite…. On CNN, Budget Director Mick Mulvaney promised that “the president is not going to sign a bill that raises taxes on the middle class, period.” Yet this is what the Senate tax bill does. Information about tax cuts keeps trickling out with these disasters after this post on Nels New Day. Gone are tax credits for plug-in motor vehicles, deductions for medical expenses and moving expenses, write-offs for tax preparation, most tax benefits for college in student loans and tuition waivers for graduate students, deductions for theft or loss of valuables—even in wildfires. Although low-income housing keeps its small subsidy, the bill ends the tax-free status of bonds for financing and repair, which has the same affect as dropping the subsidy. Affected by this loss are all private enterprises serving the public interest such as airports and waste disposal facilities. A huge drawback to the GOP tax bill is that it continues to move manufacturing offshore. The bill allows manufacturers to pay nothing to the U.S. for its products. CEOs won’t bring foreign profits into the U.S. when their taxes are based on the country where factories are located. The GOP fantasy is that these companies will invest in U.S. jobs. They have not done this in the past, and they have blatantly said they won’t do it with the proposed tax bill. The 15 corporations benefitting most from the 2004 tax holiday cut over 20,000 jobs and reduced their research spending. A basic GOP premise of tax cuts is to punish blue states and reward red states that already get back more than they pay in federal taxes. The punitive measures come from curtailing or eliminating the deductibility of state and local taxes and dropping the home mortgage interest deduction. Congress also refuses to provide any assistance for the billions of dollars lost to wildfires in the West while giving tens of billions to Texas and Florida for help after hurricane damage. Puerto Rico, which can’t help Republicans win a presidency, will get funding but only through loans. Republicans claim that dropping health insurance mandates from the Senate bill, but people who get subsidies will continue to buy the insurance. There will be no savings for the government. Alimony: No longer deductible for decrees after 2017. College boosters: No longer deductible if for eligibility in buying seats at games or preferences such as prime parking places. Employer-provided housing: A cap of $50,000 salary. Home sale gains: Qualification requires the home to be the primary home for five of the past eight years instead of two of the past five years. Stadium bonds (DDT promised to do this to the NFL). Businesses because they receive three-fourths of the benefits. Owners of jets and golf courses. The savings on each of these are minimal compared to lost benefits, but it should keep Dictator Donald Trump (DDT) satisfied. Churches that can campaign for political candidates. Anti-abortion activists because people can name fetuses as beneficiaries of 529 college savings plans. The tax bill defines “child in utero” in personhood terms as “a member of the species of homo sapiens at any state of development, who is carried in the womb.” Law already covers the 529 accounts, but the bill throws the door open to making all abortion illegal. Inheritors for 5,500 estates that drops not only tax on the estate but also on any capital gains on inherited taxes until they are sold. House Speaker Paul Ryan (R-WI) tries to convince the people that the new plan is “fair” and “simple” because taxes can be filed on a postcard. Yet the card has no instructions on the card to explain what should be put in a line—i.e., what is a savings plan?—and even asks for the Social Security number to be put on the back of a card that gets put into the mail, available for anyone to see it. And people pay more taxes. VP Mike Pence sounded sincere when he lied to a Wall Street CEO gathering. He claimed that workers could keep more of their money (false) and companies are incentivized to bring jobs back to the United States (false). Instead of eliminating loopholes, the tax bill leaves them only for the wealthy. According to Ivanka Trump, people can use their tax cuts to hire a tutor to teach their children the Mandarin Chinese language. Gary Cohn, DDT’s multi-millionaire economic advisor, cheerfully claimed that people can use their $1,000 in tax cuts for remodeling the kitchen or buying a new car. Bruce Bartlett, an expert in supply-side economics serving under Presidents Reagan and George H.W. Bush, said, “There has never been a tax cut in American history in which taxes were raised on the poor to benefit the wealthy. I don’t know of any other country that has done anything remotely like this.” After 1986 tax cuts, wages fell for ten years. Most Republicans have no answer for the failure of tax cuts although Mulvaney tried to explain that the world is different now. When Bill Clinton raised taxes on top earners from 31 percent to 39.6 percent in 1993, the economy boomed. It created 23 million jobs and grew the economy for 32 straight quarters, at that time the longest expansion in history. According to a Quinnipiac poll, only 25 percent of people like the GOP tax plan, and only 16 percent think it will reduce their taxes. Thirty-five percent expect their taxes to increase. Only 24 percent say it will help the middle class the most, while 61 percent think that the wealthy benefits most. This photo shows the GOP position toward tax cuts that take money away from most of the people to benefit the wealthy. The “King of Foreclosure” Treasury Secretary Steve Mnuchin and his ultra-wealthy wife admire new bills with his name emblazoned on it. The Republicans have only one reason to destroy the U.S. economy with their tax cuts: get their donors back. If they don’t pass something, nobody will fund their campaigns. In their reality, better to pander to donors than help the hundreds of millions of people in the United States. Susan Collins (ME): She opposes dropping the health care mandate, the “biggest mistake,” because it causes insurance premiums to drastically rise. Ron Johnson (WI): A conservative, he owns a small business and wants more perks for it. His demand will increase the deficit and take the amount into an area 60 instead of 50 votes. Bob Corker (TN) and Jeff Flake (AZ): They don’t like the $1.5 trillion—or more—deficit. Lisa Murkowski (AK): She also doesn’t like dropping the individual mandate but said that “one should not assume this is a precondition for my support for the tax bill.” She likes the Arctic oil drilling in the bill. Rand Paul (KY): He might back out without the repeal of the individual mandate. It’s all a crap shoot; in the meantime we have Thanksgiving. The big GOP tax plan was to be released on November 1, but problems delayed it–perhaps because it wasn’t written and because Dictator Donald Trump (DDT) insisted it be called “The Cut Cut Cut Act.” As Stephen Colbert pointed out, at least he didn’t spell the bill with three Ks. So far, the name has been DDT’s only contribution to the tax “reform” bill; all the other disasters come directly from GOP legislators. Most Republicans and all Democrats were left out of the process that had $5.5 trillion in tax cuts over the next decade while adding $1.5 trillion to the deficit. The proposed bill emerged on November 2 to more publicity than the fast-developing investigation into DDT’s connection to Russia. As always, DDT was largely ignorant about the nuts and bolts, but he loved the idea of filing taxes on post-card sized papers. DDT was so excited that he kissed the form, but like other relationships, it rapidly disappeared. House Ways and Means Chairman Kevin Brady (R-TX) said that people won’t be filing taxes on the card. DDT will need to go back to his love affair with the flag. At the very end of 429-page document is a roll-back of a 1954 law that prevents the endorsement of political candidates in tax-exempt houses of worship, but the GOP pride of the bill is a permanent corporate tax rate reduction from 35 percent to 20 percent to benefit companies’ owners. Stockholders will become wealthier without taking any action. Only half the people own stock, and most households own very little. 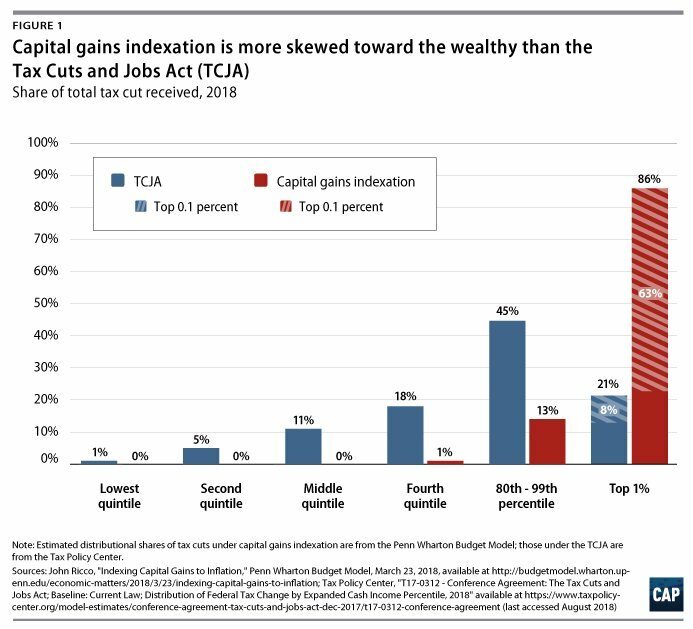 Households in the top 1 percent get 36 percent of their income from financial assets, and the 400 wealthiest households get almost 75 percent of their income from capital gains and dividends. The bottom half of the population will enrich the top half, especially the top 1 percent. Lowering corporate tax rates also leads to increasing CEO pay and stock buybacks. Profits were not used in either investment or increasing wages and hiring. George W. Bush’s “repatriation” of stashed offshore profits went to shareholder payouts. Today’s enormous deficit comes from Bush’s tax cuts and war—which DDT plans. The corporate cut will cost almost $7 trillion in the next two decades with only $1.4 trillion offset from individual taxpayers. The maximum rate for small business is lowered to 25 percent, giving a huge advantage to real estate companies, hedge funds, and private equity funds. Eighty-five percent of this tax cut goes to the top 1 percent of earners because true small businesses don’t make enough to be taxed more than 25 percent. The repeal of the estate tax over $11 million saves the wealthy $170 billion and comprises about 11 percent of the cuts. Estates grow when stock prices increase because of a drop in corporate tax. Taxes owed on $2.6 trillion in profits are cut from 35 percent to 12 percent. Fully three-fourths of tax cuts are directed at businesses and large estates. The top 1 percent, those earning at least $733,000 a year, will each annually receive $130,000. The special low tax rate for lobbyists, corporate lawyers and wealthy business owners isn’t available for people who work for a salary or hourly wage. Education, job training, and social services lose $200 billion. The loss of jobs comes from wealthy corporations encouraged to outsource jobs in the U.S. and shift profits offshore through slashed tax rates on foreign profits. The slightly expanded child tax credit from $1,000 to $1,600 expires after five years, followed by increases in taxes, whereas the 20-percent corporate rate is permanent. Even Republicans who tend to “spin” advantages of their bills can’t promise that taxes won’t be increased on middle-class families. Deductions for mortgage interest on new homes stops at $500,000 instead of $1 million. Two heavy hitters, the National Association of Home Builders and the National Association of REALTORS, oppose this provision. Deductions for property taxes ends at $10,000. State income taxes won’t be deducted, causing double taxation. Raising the “standard deduction” $11,300 to $24,000 for married couples while eliminating personal exemptions hurts families with multiple children. Itemized deductions on charitable contributions will continue, but others disappear: property and casualty losses, student loans, the adoption tax credit, teachers’ $250 out-of-pocket expenses for the classroom, alimony payments, and medical expenses. Because the medical deduction doesn’t start until costs over ten percent of income, poor people are the biggest losers, especially because they can no longer deduct nursing home costs. People with disabilities will face more barriers: small businesses will no longer receive a credit for making their businesses more accessible or hiring disabled people. People who earn less than $23,700 a year might expect a tax cut of only $80 a year. About 13 million filers making under $100,000 will have tax increases, a number that will grow as benefits are phased out. The repeal of credits for drug companies to develop new treatments hurts people with rare diseases. Other repealed credits are for electric vehicles and rehabilitation of old or historic buildings, that created 2.4 million jobs and returned $1.20 for every taxpayer dollar. Over one-third of taxpayers have incomes below their standard deduction and personal exemptions. DDT has also pulled any DACA solution from the bill. Giving unearned benefits to people who own or inherit financial assets is not good for growth or productivity. Allowing companies to write off the full value of new capital investments instead of spreading it over years gives a one-time jolt without future growth. The deficit of $1.5 trillion could fund all federal education spending, job training, the threatened Environmental Protection Agency and the State Department, homeless assistance, and welfare many times over. The supply-side economics giving cuts to businesses to create jobs may have worked during the Reagan administration when the highest tax rate was 70 percent—twice what they are now. Now corporations won’t add jobs for products until there is a demand, and giving the bulk of the tax cuts to the wealthy doesn’t create that demand. The growth can also be hurt by an increase in U.S. debt because investors get concerned when the debt-to-GDP-ratio is over 100 percent. That concerns translates into higher interest rates on bonds. The increased debt also takes money from building infrastructure and other job-creation uses. The more than $100 billion in tax cuts to the top 1 percent of earners could fund food stamps (SNAP) and other federal nutrition programs. The biggest debate about the tax bill may be dropping the corporate tax rate. Although less than half of the people think that taxes on businesses are too high, 60 percent of them want to lower corporate taxes. The going current rate for these taxes may be 35 percent, but most of them don’t pay more than 15 percent. Some examples of corporate tax cheats. DDT blatantly threatened Treasury Secretary Steve Mnuchin and economic adviser Gary Cohn for any glitches in passing the tax cuts. Before he left on his 12-day trip to Asia, DDT said that they will be staying back from the trip to Asia to remain vigilant and making sure the tax cuts pass. So if I have any problems, I will be blaming Mnuchin and Cohn. Believe me, they’ll be hearing from me.” He gave the same spiel about former HHS Secretary Tom Price who is not longer with the administration. Cohn’s arguments will be interesting; he’s already told people that they can use their $1,000 savings to remodel their kitchens or buy new cars. “Conservative leaders would have slammed this Big-Government Budget under Pres. Obama. Now, they demand Republicans in Congress vote for it,” tweeted Rep. Justin Amash (R-MI). “2011-2016: Principles! 2017: End justifies the means.” The “ends” are getting back donations that dried up after the GOP continually failed to pass any major bills. The proposed bill eliminates the individual alternative minimum tax (AMT) legislated to stop the very rich from abusing loopholes. In 2005, DDT paid $31 million because of the tax on his income of $152.7 million. Without the AMT, he would have paid $7.1 million—five percent of his taxable income at an 80-percent reduction. The proposed flat rate for pass-through income would benefit DDT in his hundreds of unincorporated businesses. His $67.4 million in income from these businesses in 2005 would have been subject to the 39.6 percent rate, but his unexplained losses have probably disappeared by now. The proposed bill drops his tax rate to 25 percent. Abolishing the estate tax would eliminate a possible $800 million that his heirs would have to pay from his potential $2 billion of unsheltered assets. When DDT promised people a “big, beautiful Christmas present,” he meant that the gift would be for himself. Republicans are still tweaking the tax bill. One idea is repealing the individual mandate to purchase health care. The other cuts $81 billion from tax breaks for individual taxpayers by changing the way that the bill measures inflation and move taxpayers into higher-tax brackets more quickly. Again, the proposal would hurt middle-class taxpayers and leave the wealthy to collect their money. Kevin Brady said that more changes would come next week. Kansas proved that the GOP tax plan won’t work. Children paid for that disaster in the state; they will pay for the disaster in the United States if the bill passes.